You can use Orbi with the Circle Disney app to manage content and time online, on any connected device. 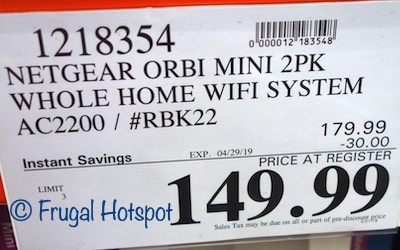 Select Costco locations have the Netgear Orbi Mini Whole Home WiFi System 2-Pack on sale for $149.99 (after instant savings), now through April 29, 2019. That is $30 off Costco’s new lower regular price of $179.99. While supplies last. Price, participation, and sale dates may vary by location. Item #1218354. This product was spotted at the Covington, Washington Costco. 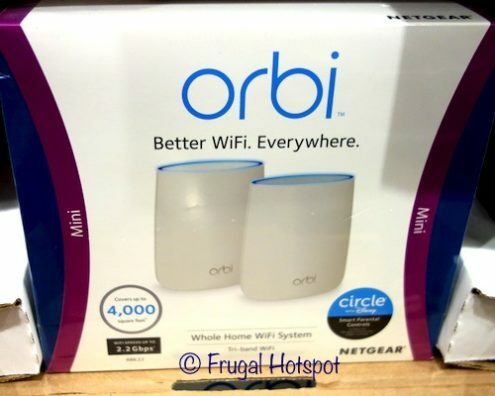 • The Orbi Tri-band WiFi system provides a single WiFi network for your whole home. • Doesn’t require an account to setup – just plug in and follow the instructions on your mobile device or computer. • Personalize the Orbi app (no account creation or personal information required). • Works with Circle with Disney app to set filter levels for each family member, create daily time limits on apps and popular sites, pause internet access with the press of a button, and check usage stats.